One of Horner's strengths has been managing young drivers - a legacy, perhaps, of his days running his Arden team in Formula 3000. 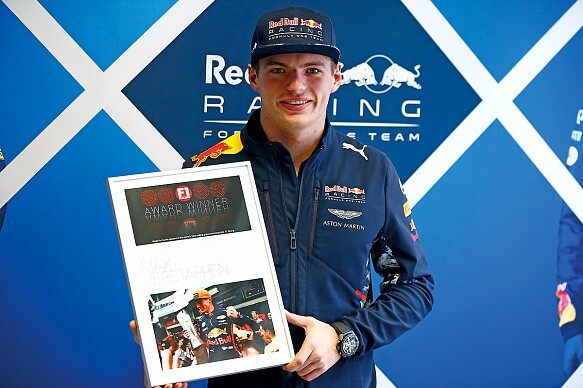 Despite a bad year in terms of reliability and a slow start on the performance front, he's managed the expectations of the youthful Max Verstappen - and, more importantly, convinced Max to extend his deal with the team until the end of 2020. The partnership with Daniel Ricciardo is arguably the strongest driver pairing in F1, so Horner will be tested in the coming years if the pair are squabbling over wins. Thankfully he can draw on his experiences of smoothing fractious tussles between RBR team-mates Sebastian Vettel and Mark Webber in seasons past. With a new set of regulations for 2017, many predicted Red Bull would be fighting for the world championship. But power unit reliability and performance has fallen short again. Horner's biggest frustration remains the engine formula. As a loyal Bernie Ecclestone ally, he has had to ingratiate himself with F1's new owners and has spoken eloquently of the need for change. He has always maintained that the drivers should be cast as the heroes who race the world's fastest machines - and they should be using a much simpler powertrain. As Horner has proclaimed on numerous occasions: "It's down to us to provide [our drivers] with a competitive car." Otherwise, as he knows only too well, they go looking for seats elsewhere. 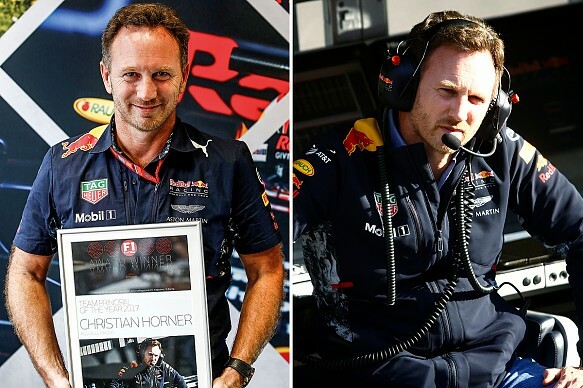 Christian Horner: "To win an award that has been voted by the public always has an extra special satisfaction, and I'm flattered for the second year in a row, despite not winning on-track, to collect this award. "I'm hugely honoured and grateful to the readers of F1 Racing and it's nice to beat Toto [Wolff] at something this year. We'll be fighting hard to give the best cars we can to our drivers next year to hopefully take the fight to Mercedes and Ferrari." The Circuit Gilles Villeneuve in Montréal is a tricky little track to master. Its chicanes and short-radius bends require hard braking and precise rotation points with the car. The closer a driver can get to the edge of the concrete walls that line the exit of nearly all the corners, the quicker they will be. In Montréal this June we witnessed a masterclass. In Q3, Sebastian Vettel went fastest on his first run, only to be eclipsed by Lewis Hamilton. On Vettel's second run he got within 0.004 seconds of Lewis. But then the Mercedes man demolished his own previous best time with an inch-perfect belter, setting the fastest lap ever recorded at Montréal and - more importantly - matching Ayrton Senna's 65-pole record. When he stepped out of the car, Hamilton was handed a replica Senna helmet, a gift from the family of the fallen great. 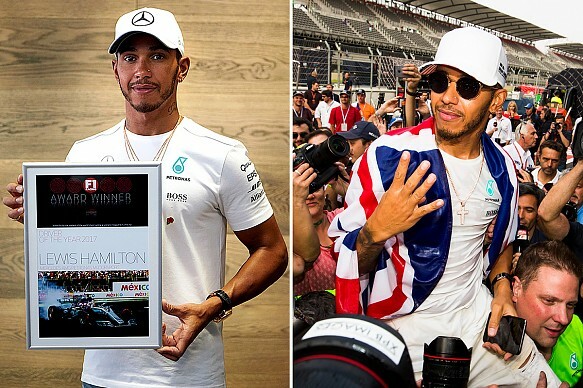 "Ayrton is the one who inspired me to be where I am, and to match him and receive this is the greatest honour," said Lewis after qualifying that day. "I equalled Ayrton in race wins (41) a while ago so this has been my focus. As a kid I thought if I was lucky, I could emulate Ayrton and it's strange to think that now I have that many poles." At Monza, just six races later, Hamilton set a new benchmark: he scored his 69th pole position to put him top of the all-time pole positions list - eclipsing Michael Schumacher's 68. 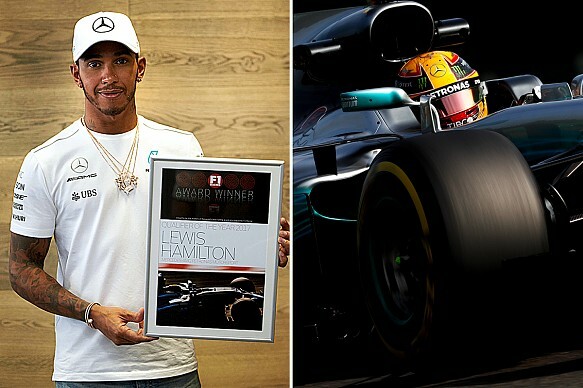 Lewis Hamilton: "It's awesome to receive this award again. It's been such a special year on so many levels, so much growth, and qualifying has been very solid. I always look forward to Saturday and try to squeeze every drop out of the car - and a little bit more. It's a really pure moment, when the car is at its lightest and most nimble." The official Formula 1 video on YouTube from on board Max Verstappen's Red Bull during his charge from 16th on the grid to seventh place at this year's Chinese GP has had 1,009,012 views - at the time of writing. And it's worth watching again and again. A spark plug problem had demoted Verstappen to a lowly 16th on the starting grid. Drizzle on Sunday morning damped parts of the circuit, and the low track temperatures made the early running extremely slippery. But Verstappen was about to put in one of the laps of his life. Turn 1, then started to get aggressive on the outside of Turn 2, fighting the oversteer on the gripless surface, and overtaking Sergio Perez's Force India. Entering Turn 6, Verstappen was super late on the brakes and easily passed Lance Stroll. Ahead of him, Fernando Alonso was also scything through the field, and Max followed the Spaniard as he went wheel-to-wheel with Danill Kvyat around the quick left-hander at Turn 7. He passed Alonso around the outside of the switchback and set himself up to pass the Williams of Felipe Massa. This was the riskiest move on the lap, and with a late-braking lunge he made the apex of Turn 11 and claimed eighth place. The cherry on the top arrived when that position became seventh as Nico Hülkenberg scuttled for the pits. Max Verstappen: "To get start of the year is great - I'd thought it might just be decided by the run off the line into Turn 1. In that case, I had a better start in Canada, which I see was rated the fourth best start of the year. But China, yeah, it just all happened so quickly. You just pick your moment. Inside, outside, cutting through the traffic... it was very special." The fight for the fastest pitstop of each race is a closely contested competition. The difference between the quickest and slowest is measured in fractions of a second. Larger, heavier wheels made for an additional challenge this season, but last year's Pitcrew of the Year, Williams, continued their good form into the early races of 2017. But at Sochi, Red Bull topped the quickest pitstop chart when Max Verstappen was stationary for just 2.33 seconds. The team were also quickest in Monaco, with a 2.6s stop (equally impressive given the tighter confines of the Monte Carlo pitlane). In the the summer, though, Williams and Mercedes vied for top honours in the speediest pitstop league. That was until Malaysia, when Max Verstappen's all-dominant drive was sealed by his pitcrew. 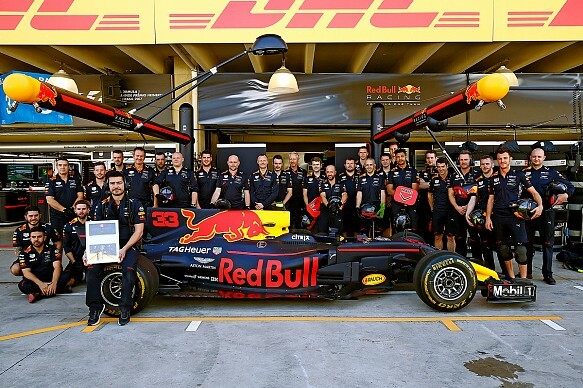 Wearing their full-length fireproof overalls in the heat and humidity of Malaysia, the Red Bull mechanics stopped the clocks at an incredible 2.21 seconds. It wasn't the fastest stop of the season, but it emphasised the significance of the team working together in harmony - and in difficult conditions - to take victory that day. RBR team manager Jonathan Wheatley says that the procedure to change tyres has become second nature to the mechanics involved: "What the gun men are doing in a pitstop is amazing. We're seeing incredible reaction speeds." Jonathan Wheatley (team manager): "I'm proud to accept this award on behalf of the team. They have put so much time and effort into their job. You can't believe the hours that go in behind the scenes in training. We're really pleased with what we've done with the equipment we've got this year, and hope to make a step again next year." It was a difficult start for Lance Stroll in his rookie F1 season. Before the flight to Melbourne he'd been troubled by numerous 'offs' in testing and his first few races were characterised by DNFs. Stepping straight up from FIA European F3 to F1 (and by-passing Formula 2) might have been a step too far, too soon. That's not to say he was without experience of F1 machinery. He'd spent much of the winter running in various private sessions around the world in a 2014 Williams, but it was with the 2017-spec machine that he initially struggled. But to be fair to the 18-year old, he was determined to ignore the naysayers, arguing that he just needed time. On the Saturday evening of Montréal there was a heated discussion between his father Lawrence and the team's chief technical officer Paddy Lowe. Whatever was spoken seemed to work, for under the pressure of his home race, Stroll scored his first F1 points on Canadian soil with ninth place. He went even better in Azerbaijan next time out. In a chaotic race where all those around him were losing their heads, Stroll finished on the podium, despite being pipped for second place by Valtteri Bottas as they crossed the line. After Baku, he recorded seven straight finishes, banishing the popular belief that he couldn't stay out of trouble. And he put in an impressive qualifying performance in the atrociously wet conditions at Monza, to nail a front-row slot. 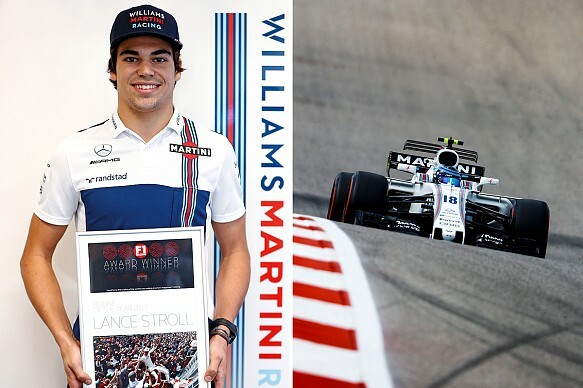 Lance Stroll: "To receive this is an honour, I really appreciate the support. There have been some highlights to the year, standing on the podium and on the front row. But we've also had our lows and it's been quite a journey. I'm extremely proud to be holding this award and hopefully we can build on this to achieve more in the future." During the Azerbaijan GP weekend, Ricciardo struggled to hang on to the RB13 in low-downforce trim. When he hit the wall at Turn 6 in the final period of qualifying, he must have thought his chances of victory were long gone. Ordinarily, starting in tenth place would have ruined his prospects of a good result, but this proved to be no ordinary grand prix. "The odds of even a podium were pushed further back when we had to make an unscheduled early pitstop," explains Ricciardo. "I think I was as low as 17th after that." With a long flat-out run from the last corner on the Baku street track to Turn 1, the art of getting into a rival's slipstream and using the 'tow' is hugely beneficial. And Ricciardo did that beautifully on one restart to leapfrog both Williams cars and Nico Hülkenberg's Renault, only locking up at the point of turn-in: three cars in one move. "We were all nearly four wide," he says, "but I managed to get third and I think that was, in a way, the winning move. Once I saw the gap I was going to do everything I could to brake as late as possible and get that position." 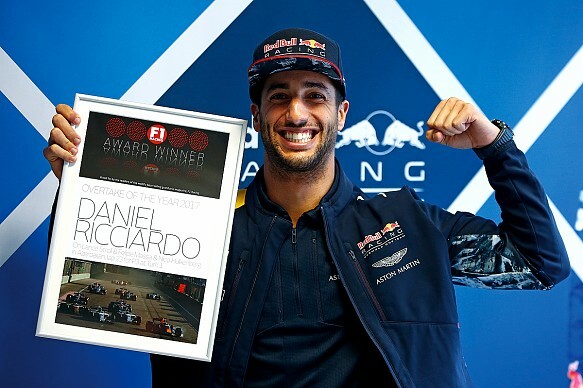 Daniel Ricciardo: "Second best as well, awesome. The fans got it right - sweet! It was a good move, thank you kindly. I don't think I've ever passed three cars in one move before, because Hülkenberg was there too. It was good fun and particularly in the last few years I've really had the blinkers on with some moves where I really didn't care about the outcome. That was one of them." Despite the verbose full name of the car, the Mercedes AMG F1 W08 EQ Power+ has been the class of the field - winning both the drivers' and constructors' championships - but it has also been tricky to master. Early on, team boss Toto Wolff described the W08 as a "diva". "It's not been an easy car to get to grips with," says Mercedes' chief race engineer Andrew Shovlin. "And a lot of that is with the scale of the regulation change. We didn't really have everything working together, especially in the early races. "For us, it's been one of the most difficult years we've had, not just in the championship battle, but so many elements of the car and tyre that we had to understand. But what you could see with the car is that when it's in the right window, it's quick." The all-dominant 1-2 performance at Monza (easily 30 seconds ahead of Vettel's Ferrari) was quickly forgotten as it struggled in the hot, sweeping curves of Sepang. "Yes, there have been highs and lows to the year and it's getting difficult to design a car that's fast everywhere," adds Shovlin. "Circuits have such different requirements, but there's always areas that we can improve - and it's been important that we've done that faster than the opposition." 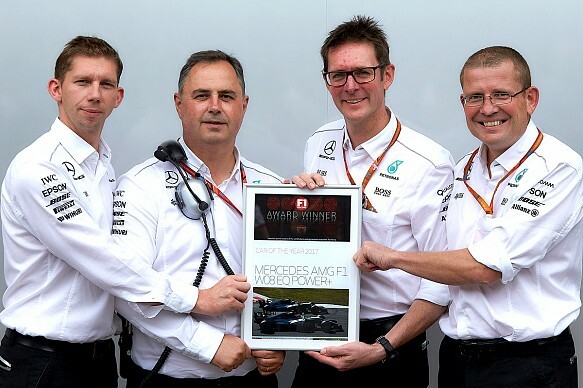 And even when the title was sealed, Mercedes continued to bring new parts, to try and get a head start on next season. Andrew Shovlin (chief race engineer): "All of our focus in development is on looking at the areas we know we can do better. That's how you don't get distracted with what's going on with the other teams. On-track we've had some fantastic battles, but most of that development has been taking place at the factory, and trying to be scientific in the way we break down problems and try and understand them to find a solution." There was a little joke that went around the Sepang paddock on the Sunday evening after Max Verstappen's second grand prix victory. In the build-up to the race, hapless Daniil Kvyat was informed by the head of Red Bull's young driver programme, Dr Helmut Marko, that he would not be flying to Kuala Lumpur. His seat at Toro Rosso had been given to Pierre Gasly. There was a lot of joy around the Red Bull hospitality unit that night. Max's family were in attendance, since that weekend he'd celebrated his 20th birthday. It was good timing, for after such a rotten year in terms of reliability and recent on-track incidents in Singapore and Monza, it was the right moment to quell any growing criticism. 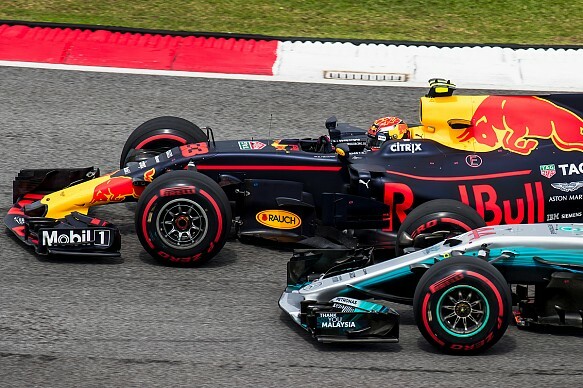 In Malaysia, Verstappen took the lead on lap four - scything past pole-position holder Lewis Hamilton at Turn 1 - and was never threatened at the head of the field. "After the season I've had, I think this victory came at a very good time," said Verstappen on the evening of his win. "Once I got past Lewis I could focus on my pace, look after the tyres, and speed up when I needed to." What Kvyat thought of the win, while watching on television at home, is unrecorded. Max Verstappen: "Up to that point of the season I had a lot of really bad luck, and to go into a race and win was great. What I also liked was that my family was there and they got really emotional. It's not only been tough for me this year, but also for them. My career had always been going up and up, but this year has been a bit more of a roller coaster." After he lost the 2016 world championship at the final race of the year, you sensed a renewed determination from Lewis to secure the trophy again this year - right from the off. Hamilton's title rival Sebastian Vettel might have won the season opener in Australia, but Hamilton struck back immediately with victory in China. He went wheel-to-wheel with Vettel in Spain and came out on top, and wasn't rattled when the pair memorably made contact in Baku. Further strong wins at Silverstone, Spa and Monza set Hamilton up for the Asian leg of the championship. Hamilton surpassed both Ayrton Senna and Michael Schumacher's pole record this season, demonstrating a growing assuredness in his driving. He wasn't making mistakes when the pressure was on, while Vettel was becoming increasingly fractious. The Ferrari man wasn't helped by reliability woes, but the first few hundred metres of the Singapore GP effectively handed the title to Hamilton. And after that Lewis didn't rest up, still striving, still pushing harder than ever. all the records set by Michael Schumacher. Hamilton's team-mate Valtteri Bottas has admitted he was surprised by how hard Lewis works. His competitors will have to try even harder if they want to dethrone him in 2018. Lewis Hamilton: "Wow, I wasn't expecting this one. 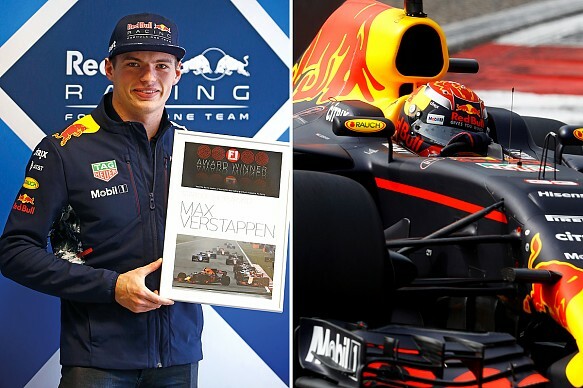 Max [Verstappen] has driven exceptionally well this year. I think there is a lot of potential in their car, and while it has had reliability issues, when it has been right, he's done a good job. To get the support that I've had and to get Driver of the Year, I can only thank the fans. It's amazing to see the fanbase grow over time." Each year we present one award which isn't measurable by statistics. There's no win or pole record to hang this prize off, but we feel there is often a driver who is deserving of praise for their relentless commitment and never-say-die attitude. In a season dogged by an underpowered and unreliable Honda power unit, Fernando Alonso has squeezed every last drop of performance potential from his McLaren. "We found ourselves in a weak position with a lot of reliability issues with the power unit, but we have seen how strong the chassis is and the development rate has continued," says Alonso. "This is a testament to how hard everyone has been working in the summer despite the poor results. I have to follow that momentum that we build in the team. "When we realised we were not competitive, we didn't give up. If the team build a new front wing, you also need to push at the maximum, to return that commitment. It's important that they see that with your driving style." 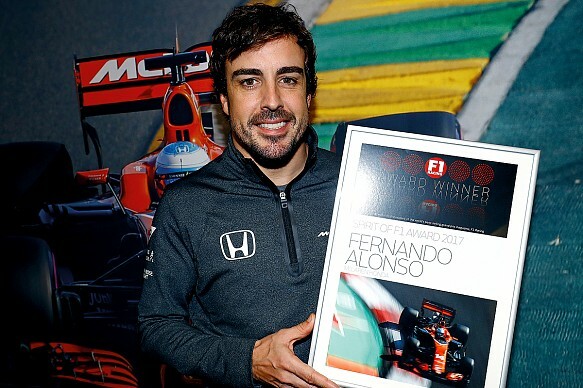 In addition, Alonso made a bold attempt at the Indy 500 - a race he could have won - and next January will contest the Daytona 24 Hours as he looks to take on Le Mans in the future. "If he could, he would race 52 weekends a year," says McLaren boss Eric Boullier. "This is his warrior spirit, this is what you wish for - and expect from - a Formula 1 driver, and I can only praise his will and his wish to race anything." Fernando Alonso: "It has been a special year, with the adventure of the Indy 500 in the middle of the season. We were expecting a lot more; with the change of regulations we felt we had an opportunity to close the gap with the front guys, but we found ourselves in a weak position. So it has been a little bit frustrating, but we kept working flat out." Is Mercedes risking a new civil war?